After every debate, every speech, every harrowing twist and turn in this ugly election, my feed floods with Hillary Clinton images. Not Hillary as she is today — with understated Ralph Lauren pantsuits and careful talking points — but Hillary then. Sometimes she’s a moon-faced young girl looking confidently out into the world with a pert, Tracy Flick–like expression, or an ‘80s power woman in pearls and shoulder pads. 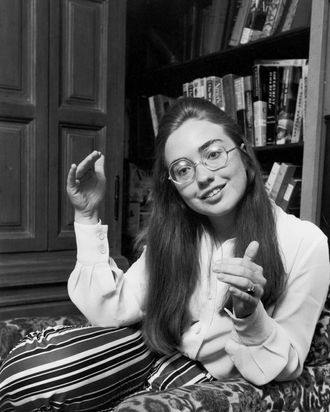 But most often, the vintage Hillary photos my friends and acquaintances like to post are from her radical-chic years at Wellesley — dressed in Gucci-worthy glasses and bell-bottoms. If we’d do well to stay on nodding terms with the people we used to be, then Instagram ensures we’ll never forget them. Obama was first elected before the photo-sharing app was a gleam in Kevin Systrom’s eye, but on Twitter and Facebook, images of the young Obama still got passed around — the young community organizer in a straw hat you could conceivably get a beer with. (A hand-rolled joint might have been in the offing, too.) You might say he was the first #TBT president. For a candidate plagued with relatability issues, and low interest from millennials, a trove of appealing vintage images might be the best thing that ever happened to Hillary. Looking at the young go-getter that she was, it’s hard to deny her leadership potential. And her activist-era hairdos might endear her to those who feel that she’s not far-left enough — look, she once dressed like Gloria Steinem! (The fact that many women in the ‘70s dressed this way is immaterial.) Then it’s on to her ‘80s and ‘90s power looks. Scrolling through these images, the effect is endearing. Like us all, Hillary has gone through phases — she wasn’t always this monolithic, powerful figure. Perhaps we can pretend she was even a little chic. Throwback Hillary photos are something of an infinitely renewable resource — I recently joked to a colleague that the only person whose life was better-documented was Madonna, whose “undiscovered” ‘80s photos have fueled an entire coffee-table-book boom. But somehow, we keep turning up more iterations: ‘90s running-gear Hillary, ’70s intellectual Hillary, Nancy Meyers–secondary-character Hillary. Fashion designers, in particular, love to re-up the pictures of Clinton in a cold-shoulder Donna Karan dress or in red velvet Oscar de la Renta on the cover of a 1998 issue of Vogue. But the thing is, the pictures aren’t really about style. Clinton has never been particularly fashion- or trend-conscious (remember her much-reviled headbands in the ‘90s? ), and gushing about how her ‘70s looks evoke 2016 Gucci misses the fact that Alessandro Michele is pulling from, and refining, that era’s standbys. The appeal lies more in the way Clinton’s many past personae help to burnish her present image. And her social-media team is definitely aware of that halo effect, posting regular throwback shots. A recent snap that looks a bit like an L.A. Law outtake shows Hillary in a blazer, staunchly facing some institutional window, ready to mete out some justice, accompanied by the words “Got her back? #DebateNight.” They offer a Hillary icon for everyone: a lifelong wonk, so uncool she’s cool; a warrior who’s been fighting for you for decades, or a loving mom. Some of her throwback images even frame her as a kind of glamour icon, in the Pinterest-ready tradition of Audrey Hepburn and Carolyn Bessette Kennedy. 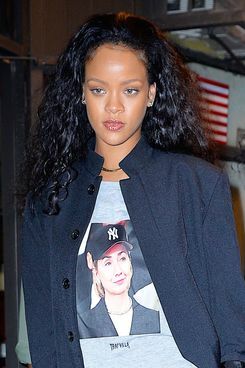 Rihanna ratified the concept with her street style recently, wearing a T-shirt with a picture of ‘90s Hillary in a Yankees cap, looking normcore avant la lettre. In the snake-eating-its-own-tail-fest that is the feminist news cycle, Lena Dunham then wore a T-shirt with an image of Rihanna wearing said T-shirt. Between their two constituencies, it was hard to miss the moment. In what has been an insanely stressful election for everyone, the reliance on Lite Hillary Content™ like this is understandable — it’s a release valve from all the unpleasantness, the email scandals and locker-room talk. We all know that Clinton doesn’t need to be fierce, or slay, or be a style icon to lead. But these images may work as effective propaganda to drive people to the polls and to feel that they have a woman they can relate to in office. Yes, in an ideal world we’d be talking only about policy, not clothes — but since we’re living in a suboptimal one, go ahead and post that #FBF on your way to the polls. It might just make a difference.